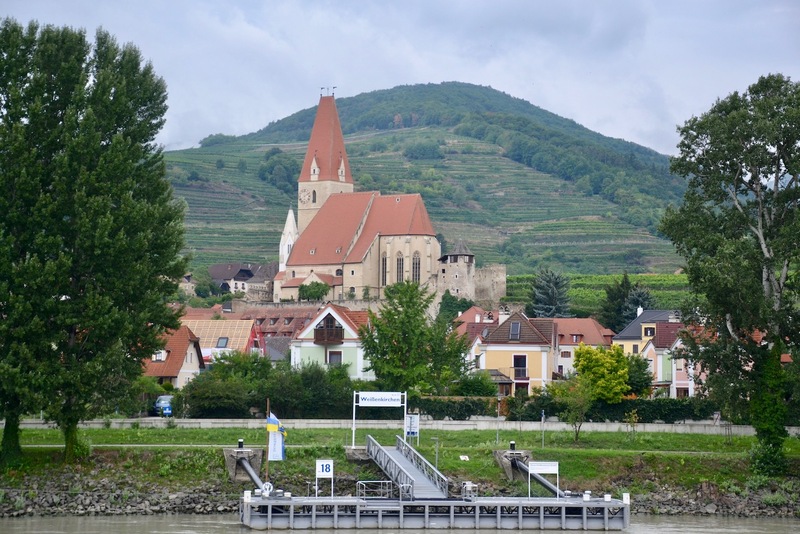 The rain stopped as we sailed away from Melk and headed downstream to our next stop at Durnstein. There was a towpath beside the river and several brave souls rode the cruise-supplied cycles all the way – we stood and cheered them when they arrived back on board. 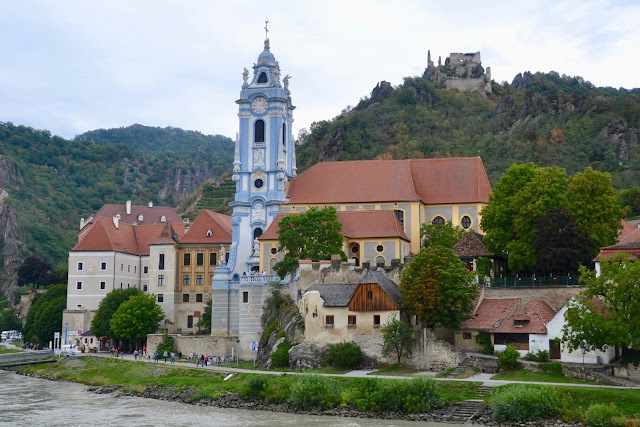 This stage of the river passes through the Wachau Valley, a world heritage site for its beauty; hilltop castles, postcard villages, vineyards, and apricot orchards carpet the hillsides. I had to acknowledge that its greenness shows the benefit of rain. This area has seen conflict over the centuries; battle after battle as empires ebbed and flowed; not only chateaux but also fortified churches tower above the river. We sat on the sundeck, relaxed, and drank in the splendour. As Durnstein approached, Weiser, one of the valley’s apricot producers, joined us in the lounge and gave a presentation, with samples, of their wares – our waiters ran around with trays of glasses as each bottle was opened. Herr Weiser pointed out that the family had stores in Durnstein and many of us went straight there from the tasting – it was that good. I bought some apricot liqueur. 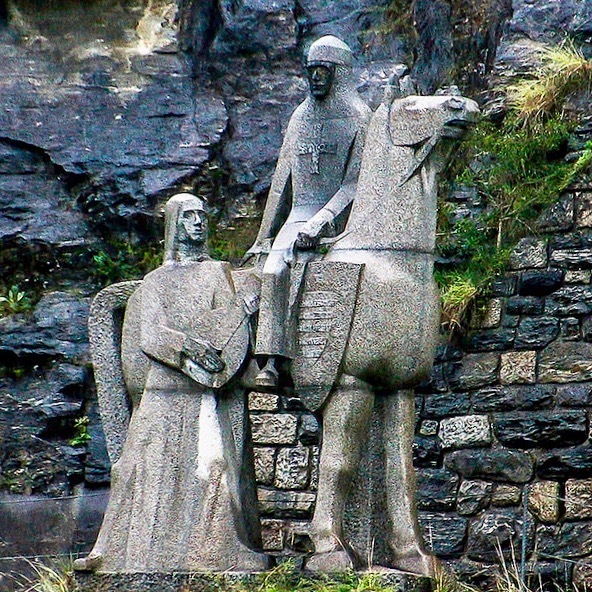 Durnstein’s most famous occupant was the English King Richard the Lionheart (Lowenhertz). Richard was a celebrated warrior – he led his first army to victory at the age of 16. The son of Henry II and Eleanor of Aquitaine, he spent most of his life fighting wars away from his home country. He was one of the leaders of the Third Crusade alongside Philip of France. It was during this campaign, against the Muslim leader Saladin, that he made the mistake of disrespecting the Austrian King, Leopold V. As they captured the city of Acre, in modern-day Israel, Leopold raised his standard beside those of Philip and Richard. Believing him to be a mere vassal of the Pope, Richard’s men cast Leopold’s standard down into the moat. As he journeyed home, Richard was captured by Leopold and held for ransom, here in Durnstein Castle. Leopold asked a King’s Ransom but didn’t reveal where he was holding his captive. In legend, Blondel, Richard’s trusty troubadour traveled from castle to castle singing a verse from a love song he’d composed with Richard. When he reached Durnstein, Richard sang the second verse back to him and thus his prison was revealed. There’s a statue commemorating this beside the castle. The walk up to the castle was steep and lengthy and there’s little of the fortress left but the views. 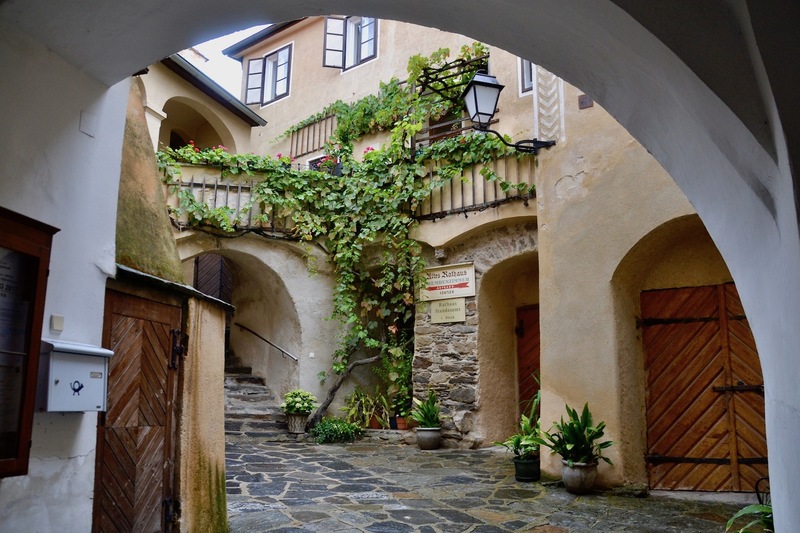 So, we decided to pass and explored the village instead – it’s charming as it hugs close to the hillside, forcing you to walk up and down steps and pass through archways as it reveals its treasures. Not quite Melk but there’s a beautiful church (Stift) cast in Wedgewood blue – the church tower is a Danube landmark. Set in the former Augustine Monastery it discloses a lush interior of gold, marble and, of course, its own pair of Catacomb Saints. As we purchased our Weiser liqueur it started to rain again, so it was time to head back to the ship for supper and the journey to Vienna – I couldn’t wait to visit the City of Music. So when do we get to Vienna? Can't wait!